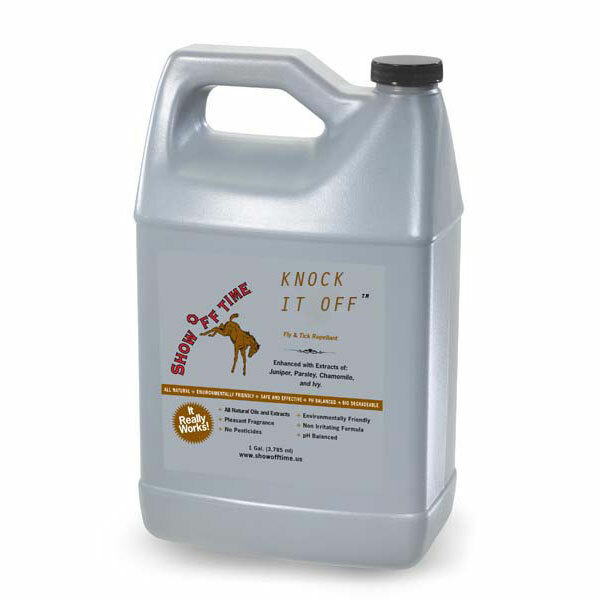 Knock It Off is an effective all natural fly and tick repellent combining selected biological oils and extracts. Knock It Off is easy to use and is non-toxic. Knock It Off has a non-irritating formula and does not contain any pesticides. This is a great product. It really helps keep the flys off without leaving a coating or unpleasant smell on my horse. The fact that it is a natural product is a big plus. I have been using this product for years. Also, it is a great value. I recently purchased this fly spray from Jedlicka's in Los Olivos. I was about to buy my usual fly spray, which is pretty effective but has chemicals and is more than twice the price of this one. A worker at the store suggested I try Knock It Off. I am extremely impressed with how well it works--the flies are so bad right now but once I spray my horse, I don't see any on her. And it seems to last too. Also, the fragrance is nice--fresh and natural. Best product out there in my opinion. I used many very expensive repellents but this one is even better than any of them so far and the price is fair. I use fly spray a lot! I've tried them all, the super toxic and the all natural. Nothing really seems to work but this product is terrific. It really works. We have been using Knock it Off for years now. There is no other product on the market that works as well and is as easy on the coat. We love this product! I love this product. Have tried many, many others but this works and lasts. I found out about this product years ago at the Equine Affaire in Pomona. Tried it and have loved it since. While running a riding school with 20 horses, I needed something that worked and didn't have to be applied every hour to sort of work. We have recently moved to Temecula from Yorba Linda and we seem to have different "bug". This product works on the horses and on you. Is not greasy once applied. One thing, I wish it was still in the oblong style gallons. They stored well in the tack room. It's the only natural fly spray that works!!! Love it! Was introduced to this product last year by a friend and it has been a horse saver! No more need to wrap my mustang's legs for summer to protect from fly bites! This is the 3rd year I've been ordering this fly spray. It is as effective if not more than other top brands of fly spray, I spray my horses daily throughout the summer before riding and when turned out. Because this product contains no chemicals, I don't worry about the frequency of use. Aside from the quality and safety of the product, I also find it very cost effective. Not including shipping and handling, you are saving almost half of what you would pay for a galleon of other top brand fly sprays. A coupon here or there would be icing on the cake. Best fly repellent by far. I have tried so many fly repellents. And hate all the chemicals. My rescued mare wouldn't allow you near her with fly repellent. This she allows without any trouble. If she enjoys it, it must be great. Just wish I could get it locally. All od my horses love yhis and so do I. It works! A friend introduced me to this spray and he wasn't kidding...really works and is non toxic. Flies are coming around and I just started my new gallon. Flies and mosquitoes don't bother my horses anymore. I can spray this on and their tails stop swishing. I spray mine down after a rinse and Knock it off seems to form a protective layer on their coat as they dry. With the oils in it, the hair shines, dirt doesn't stick and the bugs leave them alone. Win! This products really works! I have a pet rabbit that list the ability to use her hind legs and scoots around. The flies were landing in her no matter how many baths I gave her. I sprayed the bottom of her cage and bedding, let it dry, then sprayed a little on my hand and rubbed it into her fur...... wow! What a difference. No flies in her cage or on her. This is a 10 stars for me.